I know,the name's funny,but if you've ever been to Kerala or had Kerala food somewhere you'd be familiar with the term.Mappas[or even Pappas] is a typical Chicken/Fish/Meat preparation cooked in coconut milk and is lightly spiced.I have never come across a vegetarian alternative to this anywhere,so when I saw the recipe I had to try it.It is very similar to a Stew,but whereas Stew is spiced with green chillies and whole spices,Mappas is spiced with a ground masala which makes it more spicier than the Stew. As is with curries of this variety,it can be paired with anything.Chapathi,Appam,Idiyappam or even bread.I served it with Chapathi for a light lunch for two of us.You could add any vegetables of your choice or even replace the veggies with boiled eggs. Grind together the ingredients mentioned for the masala to a smooth paste. Heat oil in a thick bottomed kadai and saute small onions.When it starts browning,mix in the ground masala paste. Saute for 3-5 minutes or till the raw smell of the masala subsides. Add in the chopped vegetables and saute for 3-5 minutes. Mix in the thin coconut milk,vinegar and salt to taste and let it boil,then simmer and cook till the vegetables turn soft and the gravy thickens. Add the thick coconut milk and the curry leaves and switch off the pan. Never had these spicy items with aapam or idiyappam, sure it looks like a nice dish for anything! 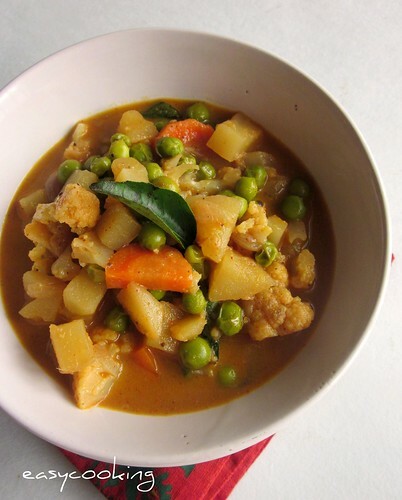 This curry is looking so tasty..simple and delicious. Looks very nice.perfect for rotis !! 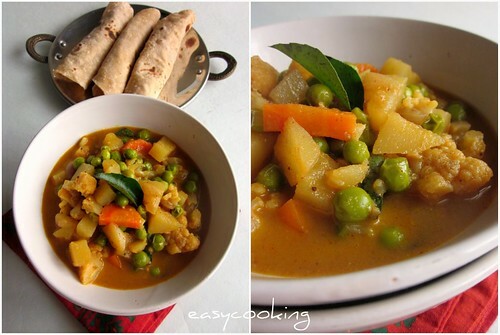 Vegetable mappas looks soo inviting, cant wait to try dish.. Thanks for sending it over to Keral Kitchen Divya! It looks yummy! Made your parrippu dish the other day. Was so yummy! Vegetbale mappas looks inviting, nice clicks. sounds wonderful, surely a new name and funny too as you said. This looks like a great vegetarian option! the pictures look great, and it sounds delicious !